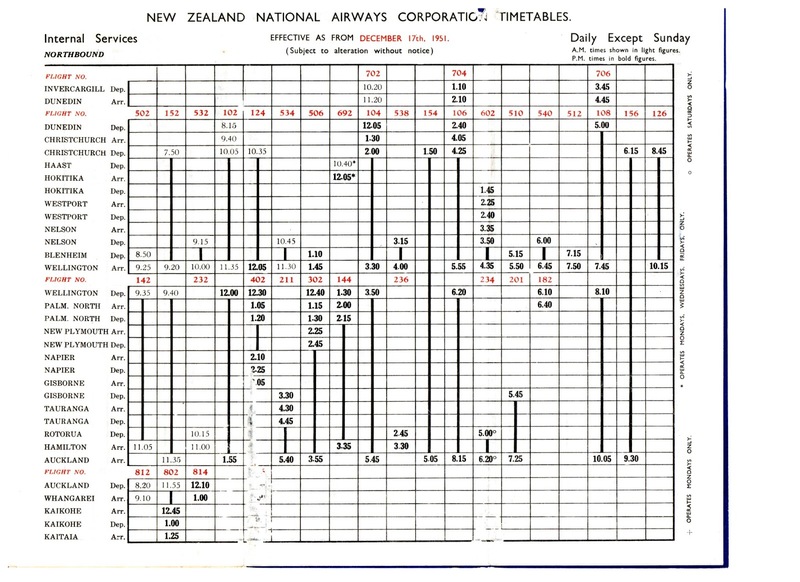 The New Zealand National Airways Corporation (NAC) took over Air Travel (NZ) Ltd’s West Coast services on the 1st of October 1947, some six months after NAC had begun operating under its own licence on the 1st of April 1947. Before the takeover the Air Travel services flew south from Hokitika to South Westland and north to Nelson via Greymouth and Westport. 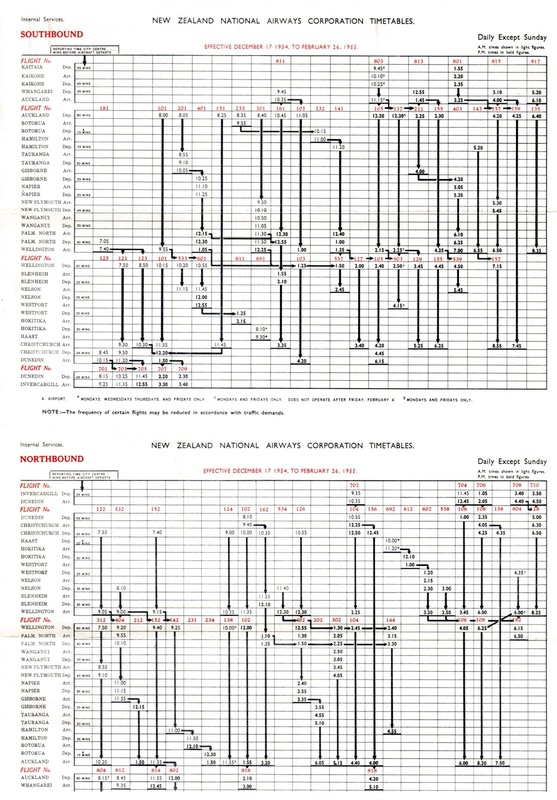 NAC’s Hokitika-based operation continued to use Air Travel’s de Havilland aircraft, two de Havilland DH83 Fox Moths, ZK-AEK (c/n 4033) and ZK-AGM (c/n T/S2810), and de Havilland 89A Dragon Rapide ZK-AHS (c/n 6423). 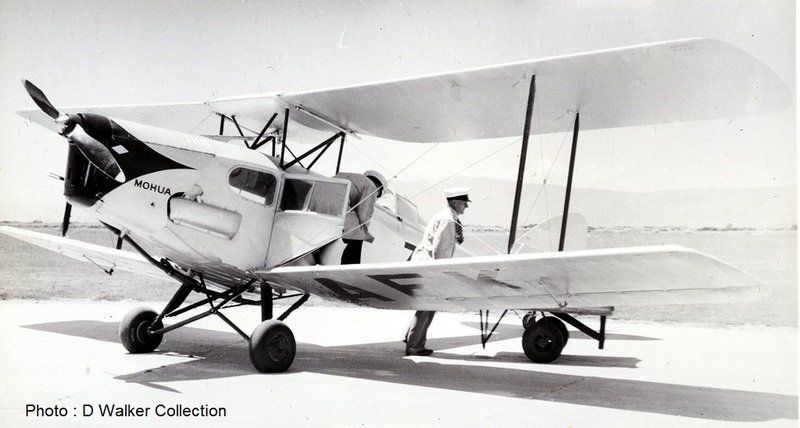 Later another Fox Moth, ZK-ASP (c/n 4097) was assigned to NAC's Hokitika base. NAC’s schedule saw one flight operating from Wellington and Nelson to Westport where it met the plane that had flown north from Hokitika. Greymouth was initially dropped from the NAC network. 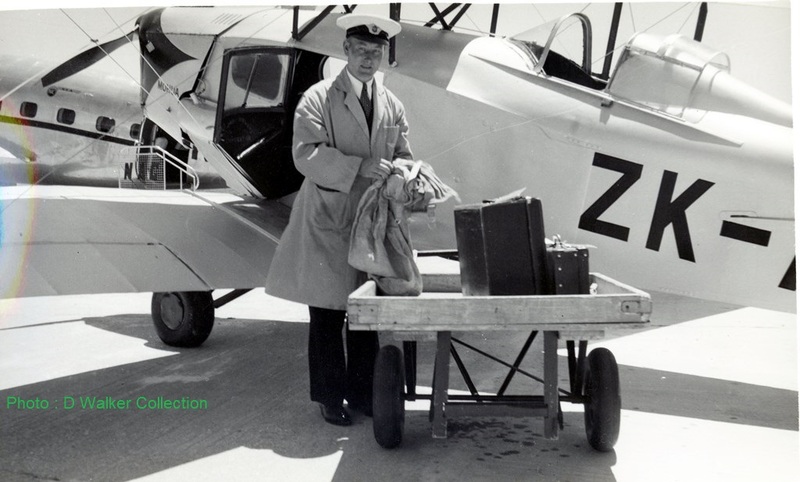 NAC’s first northbound service from Hokitika was flown on the 1st of October 1947 by Commander J F Cane in Dragon Rapide ZK-AHS. The southbound flight was disrupted when the Dominie developed engine trouble and the flight did not operate until the following day when De Havilland DH89 Dominie ZK-AKY, Tui, flown by Commander R E Overell operating the first service to Westport from Nelson. On the 17th of November 1947 NAC replaced the Dominie's on the Nelson-Westport sector with Lockheed 10A Electras. By the end of 1948 the Electras were replaced by the larger Lockheed L18 Lodestars. On the 8th of September 1948 the Southside airfield at Hokitika was closed to the de Havilland 89 Dragon Rapides and Dominies meaning that de Havilland 83 Fox Moths had to once again provide all the West Coast services. The reintroduction of the Fox Moths meant that Greymouth was reinstated as a stop on the Hokitika to Westport flights. At Westport the Fox Moth connected with the flight from Wellington and Nelson. 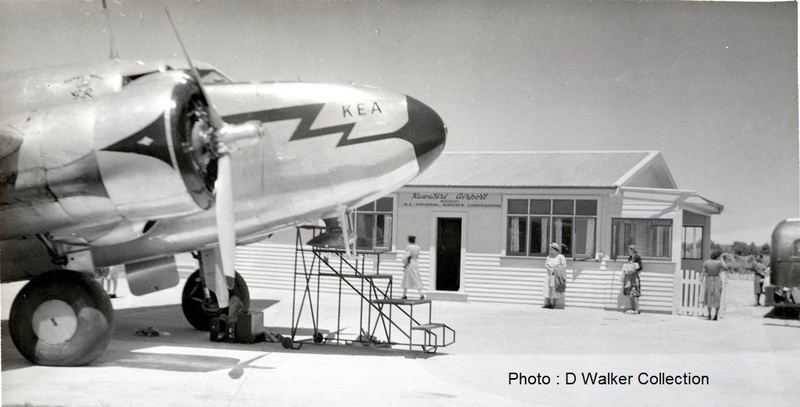 Hokitika's new Seaview airport was officially opened on the 17th of December 1951 and the Lodestar service was extended south from Westport to Hokitika. This meant the end of the small Fox Moths flying to Westport as well the withdrawal of NAC’s service to Greymouth. 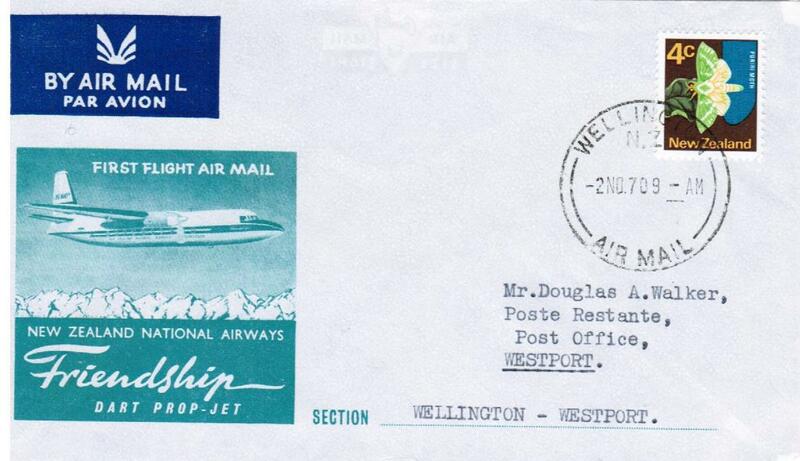 The Lodestars were on borrowed time, however, and on 31 March 1952 the much larger Douglas DC-3s replaced them on the Wellington-Nelson-Westport service while once again de Havilland Dominies operated a connecting service from Hokitika to Westport. The Douglas DC-3, ZK-AZA, from Nelson and Wellington meeting the Dominie, ZK-AKU, from Hokitika at Westport. 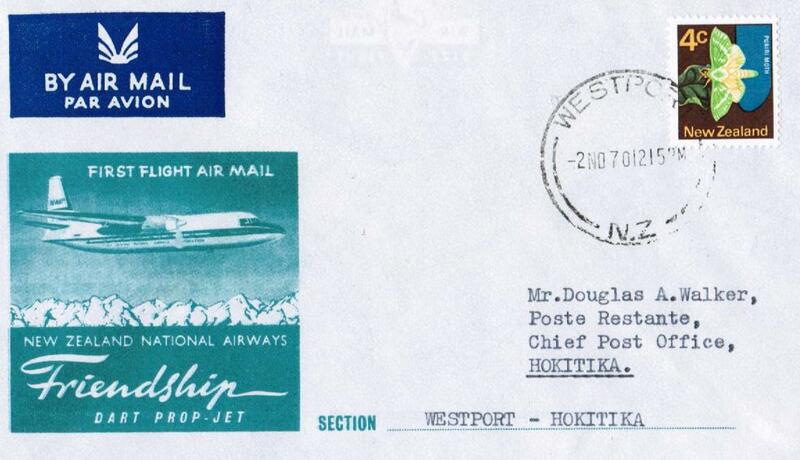 The Douglas DC-3 service was extended to Hokitika on 2 March 1953. The service from Wellington and Nelson operated Monday through Saturday while the extension to Hokitika operated on Mondays, Wednesdays and Fridays. 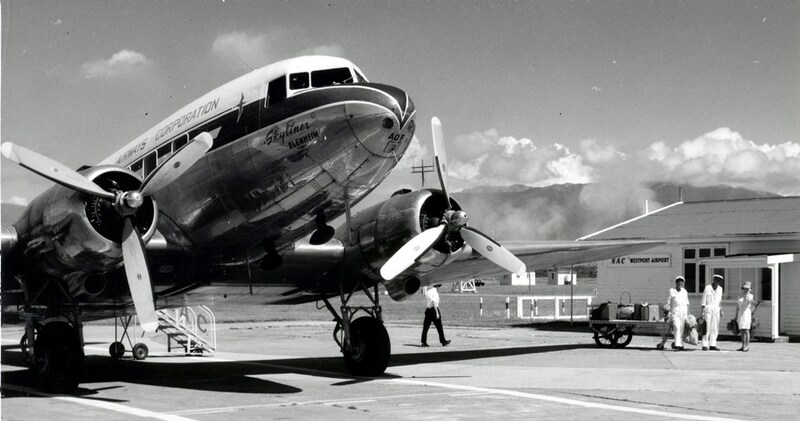 During the summer and school holidays the DC-3 south from Westport to Hokitika often ran on a daily basis. Additional flights were also offered from Wellington to Westport. In the summer holidays of 1963-64 there were 34 specials flights, though the following year this was reduced to 16 specials. Westport’s newspaper, The News, reported on the 21st of April 1966 that Air traffic handled at Westport increased by 14.2 per cent during the year ending March 31, 1966. Compared with the previous year, according to figures released by the Nelson manager of N.A.C. (Mr C. F. Bryan). A total of 7557 passengers were handled against 6615 the year before. The Westport figure represents 0.4 per cent of the total traffic handled by N.A.C. throughout New Zealand. 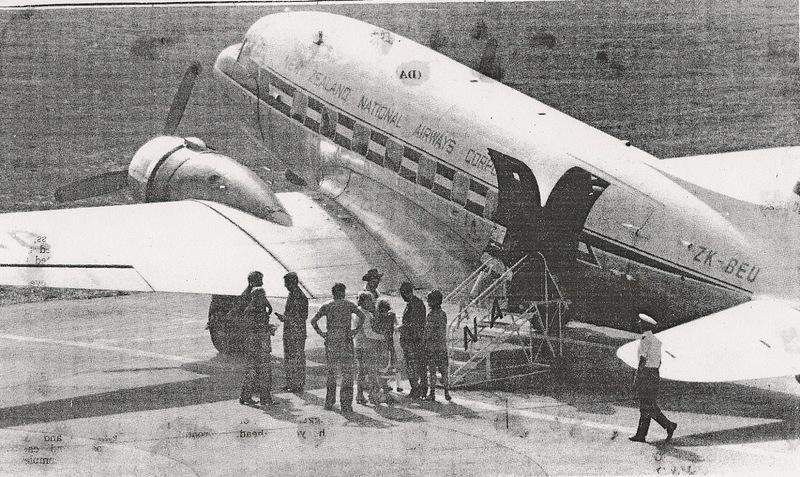 In the early 1960s NAC upgraded fourteen of their DC-3 aircraft. These were designated as Douglas DC-3 “Skyliners” and they featured larger windows and a more modern passenger cabin. 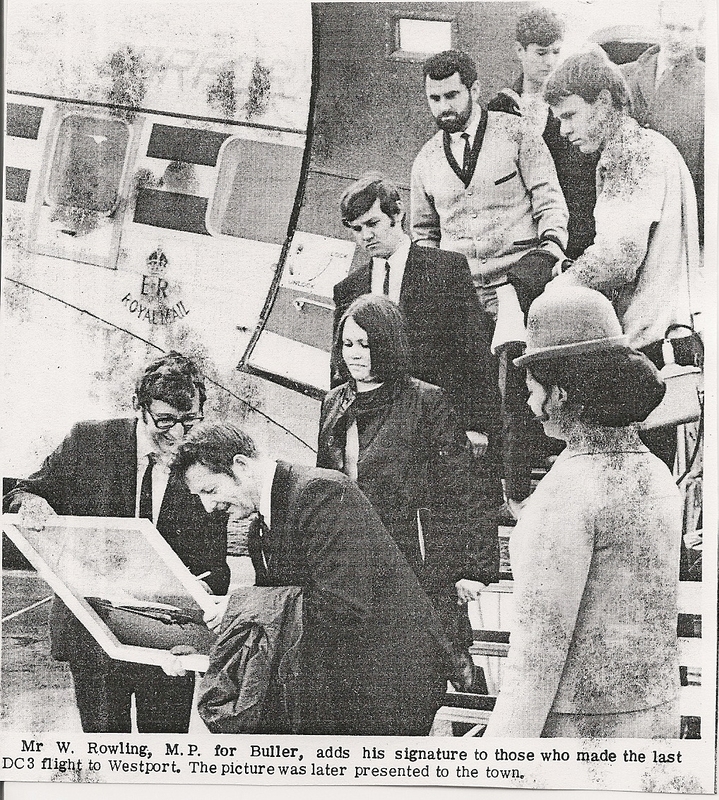 By the end of July 1966 the Westport Borough Council and the Buller County Council had offered to take over the administration of the Kawatiri airport providing the runway was sealed in the near future with full financial support from the Civil Aviation Department but though a decision was reached no action was taken for some time. The cost of sealing the runway was also problematic. 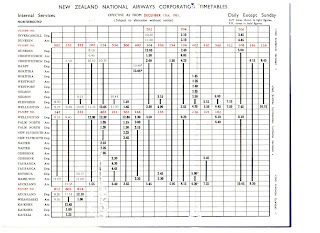 At one end of the spectrum the general manager of the National Airways Corporation, Mr D A Patterson, estimated the cost of upgrading the Westport main runway at about £300,000 while at the other end of the spectrum the County Engineer-secretary, Mr C. F. Schadick, estimated that the cost would be in the vicinity of about £50,000 due to the proximity of cement supplies and the nature of the sub-soil foundation. 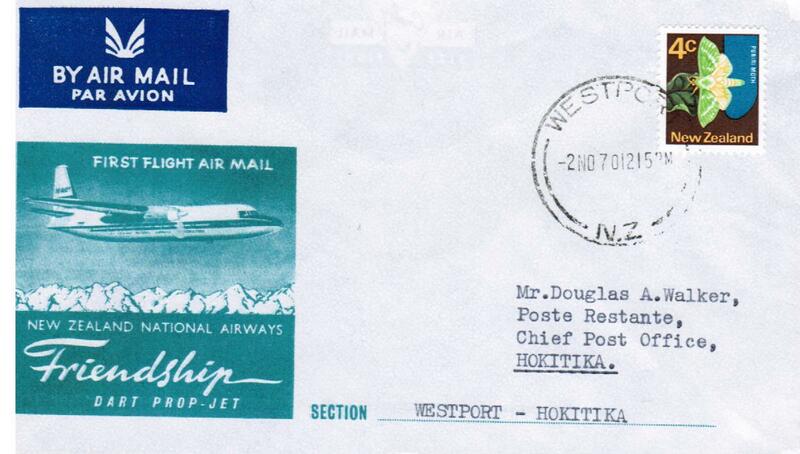 In July 1967 NAC’s Doug Patterson told the Airport Committee that all DC-3 services would be "phased out" by December 1968 and the provision of a Friendship service to the West Coast depended entirely on whether or not the Hokitika and Westport airfield are sealed. Mr N L Christiansen, the chairman of the Committee told the NAC visitors the committee wanted an assurance a Friendship service would be provided if the strip was upgraded. Hokitika was more proactive in upgrading their airport and were given promises of a Friendship service. In November 1967 a deputation to the Minister of Civil Aviation resulted in assurances that Westport would get an upgraded runway but not until 1970. In the meantime the Minister said that a DC-3 service would be continued until construction began. 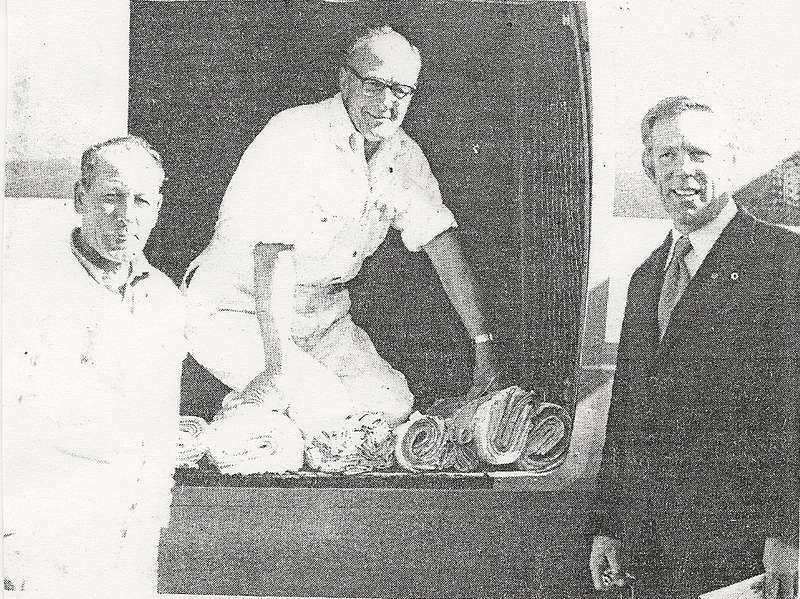 In February 1968 the Minister gave the green light for Friendships to use the Hokitika Airport but painted a gloomy picture for Westport when he told the Airport Committee that there was no immediate prospect of upgrading the Westport Airport and that the approximate cost of doing such work to enable Friendships to operate through Westport would be $300,000 on Ministry of Works standards, compared with the $120,000 basis on which local authorities had been working. The News had for years been pushing for the local authorities to act and now there was real concern of Westport losing its NAC air service. This was summed up in a letter to the Editor on 10 February 1968… The "News" has warned Buller often enough about the need to get cracking over the airport but the paper's comments were brushed aside by the local bodies as trying to put the "pressure" on. Now, it seems, your paper was right all along. As you said in an editorial a year or so ago… ''unless the committee gets moving with an upgrading scheme and seriously considers taking over the Kawatiri Airport as suggested by the Civil Aviation Department, the closest locals will get to see a Friendship is 10,000ft - from the ground." Westport’s local bodies continued to procrastinate. Mr John, Watson, the Mayor and chair of the Airport Committee told this body there was no change in the committee's resistance to invitations by the department to take over the maintenance of the airport. Faced with the costs of $300,000 to upgrade the airport Mr Watson said, “We have got to find half of this. Where do we get it from? What was the use of taking over and trying to maintain the field when no revenue was being received from it?” This was despite the fact NAC had said they would fly Friendships into Westport if they sealed the runway. By mid-1968 there were continuing debates about the cost of upgrading the airport. While the Ministry of Works estimate for the improvement was $300,000 a local firm was "confident" that they could perform the same work for $150,000. This company had taken laboratory tests of the sand and its technical director said that the reconstruction of the Kawatiri Airport could be undertaken successfully and economically by cement stabilisation of the sand formation. Such debates delayed further the upgrading of the Westport airport. Meanwhile, on Friday the 20th of December 1968 NAC introduced Fokker Friendship services between Christchurch and Hokitika. 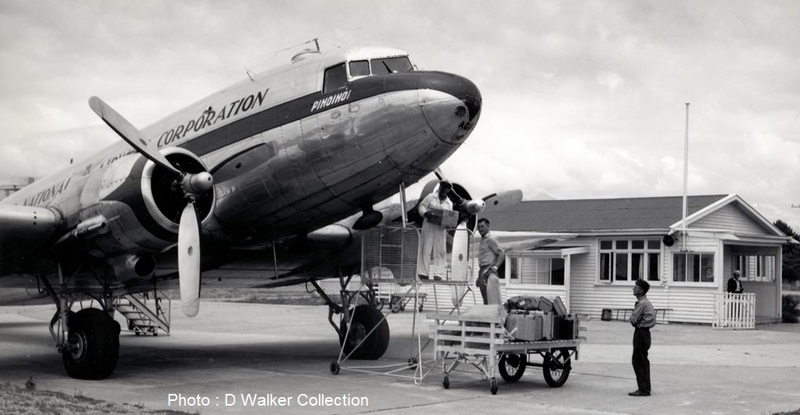 These flights connected with the arrival of the Douglas DC-3 service from Wellington, Nelson and Westport enabling Westport passengers to and from Christchurch to tranship at Hokitika thus opening Westport's first aerial connection to Christchurch. This work necessitated the closing of the Westport airport for some months. 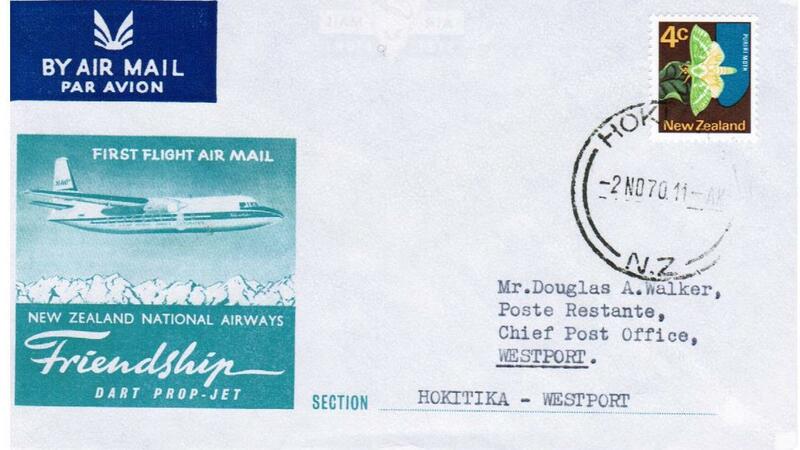 The final Douglas DC-3 flight to Westport was on the 5th of June 1970 in DC-3 ZK-BEU under the command of Captain Max Schlegel, N.A.C.’s youngest captain, and First Officer Tony Foley with Pam White being the hostess. It was a full-dress whitebait and music farewell to an old and trusted friend on Saturday. The strong bond of affection which has grown over the past years in Buller and on the West Coast for the faithful DC-3 aircraft, welled into a sentimental goodbye at Westport’s Kawatiri Airport. Clicking cameras, 300 waving people and the town band playing “Now is the Hour” sent the last DC-3 into the air on its way to Nelson and Wellington. And as it took off a bulldozer moved in from the sidelines to sweep away the old era and make way for the new. By October it is hoped the runway will be sealed and Westport will move into the Friendship age. But that is tomorrow, and Westport looks forward to it eagerly. Today, however, it was DC-3 day, and those who this most outstanding aircraft of all time has served so well were unstinting in their thanks. This was the link that made the Coast an integral part of New Zealand. And there was regret that it was to be broken. Even the weather was puzzled as to the right mood, for gay sunshine gave pIace to little tears of rain. And in the terminal building where an official luncheon included the Coast speciality of whitebait patties, leaders of the community spoke with affection of the good old DC-3. What was timetabled as plain Flight 744 became more of a sentimental parting of friends. Mr W. Rowling, Buller’s MP who must have had more DC3 flights on the Coast than anyone, spoke of the occasion as the end of an era of great service by the aircraft and their crews. And as a new one opens, he thanked NAC for its help in driving home Westport's case to the Government for the upgrading of Kawatiri. The chairman of Buller County Council, Mr N Christiansen, echoed the tinge of regret at the passing of the DC3. "Everyone in the district had 100 per cent confidence in this most faithful servant," he said. "But as we moved into the '70s, the DC-3 had to go; may the new days bring bigger and better services and public support for them.” The Mayor of Westport and chairman of the Airport committee, Mr W A Craddock, who was a guest on the final DC-3 flight to Nelson, also spoke of the sad-happy nature of the occasion. As the "flying Mayor" he has used the service more than most and he looked to a future with Friendship aircraft returning a seat occupancy rate to rival the success of that on the Hokitika-Christchurch service. Mr C. F. Bryan, the N.A.C. Nelson branch manager, said he had been thrilled by the spontaneous upsurge of affection for the DC-3. “We have great hopes that the new service will be a success, for wherever Friendships have been introduced they have brought their own traffic," he said, The new era would mean better aircraft, more scheduling and more connections for Westport. Then there were the presentations to the people of Westport, a framed picture of the DC-3 signed by all those who flew on its last trips from and to Nelson, to the crew and to Mr J. F. Cane who flew the first DC-3 into Westport and Hokitika back in 1954, and to Mrs Cane. The band played a musical farewell and DC-3 "Westport," ZK-BEU, left the Coast for the last time. One final run over Westport and then on to Nelson, where a run was made over the racecourse at Richmond as one veteran saluted another on the ground. Typical of the genuine feeling of affection for the plane was the action of one of the passengers on the last flight south. Mrs Margaret Murphy, of Granity, who is 85, and who had been holidaying further north, cut short her visit to fly on the last DC-3. But for none was the journey more of a sentimental one than for ex-Captain Jim Cane. He flew the Coast for years and his flight on Saturday meant a reunion with scores of old friends. He is a rara avis of a vanishing breed - a fully qualified engineer as well as a commercial pilot, a “character” of Coast vintage who began his flying as a boy back in 1930 and went to the West Coast where commercial aviation New Zealand was cradled. For about four years he had his own aircraft, a youngster as much fascinated by engine as flying. He qualified as a commercial pilot and as an engineer in Wellington and by 10936, in the hey-day of Captain Bert Mercer, Jim Hewitt, and Jean Batten, he was ground engineer and commercial pilot at Hokitika Aero Club, Those were the days of the Fox Moths and the Dragonflies. The services to the back country of South Westland was the only link between civilisation and many gold prospectors, farmers and whitebaiters. "Sometimes," he recalls, "one almost flew by the seat of one's pants. It really had its moments." A spell with Union Airways, service with the R.N.Z.A.F. during the war, and he joined the newly-formed N.A.C. where his knowledge of the vagaries of the turbulence and uncertain weather of a mountainous land were invaluable. His retirement four years ago took him into the quieter paths of a gardening shop. It would have been impossible to keep him from a visit to the flight deck. There with one of the younger captains of N.A.C., Captain Max Shlegel he pointed out landmarks along his own memory lane… “I once flew an aircraft off that beach… hazardous I can tell you." Captain Shelgel, a smiling, gentle giant, is an Aucklander but by now perhaps more of a Coaster. He has been on the DC-3 run to Westport and Hokitika for two-and-a-half years. He is sad to see the DC-3 having to bow to age and economics. "They're magnificent aircraft. They gave me my first command," he said. But his, association with them will last a little longer for he now transfers to the last service which they are used; in Northland, but even that will come to an end on August 20. 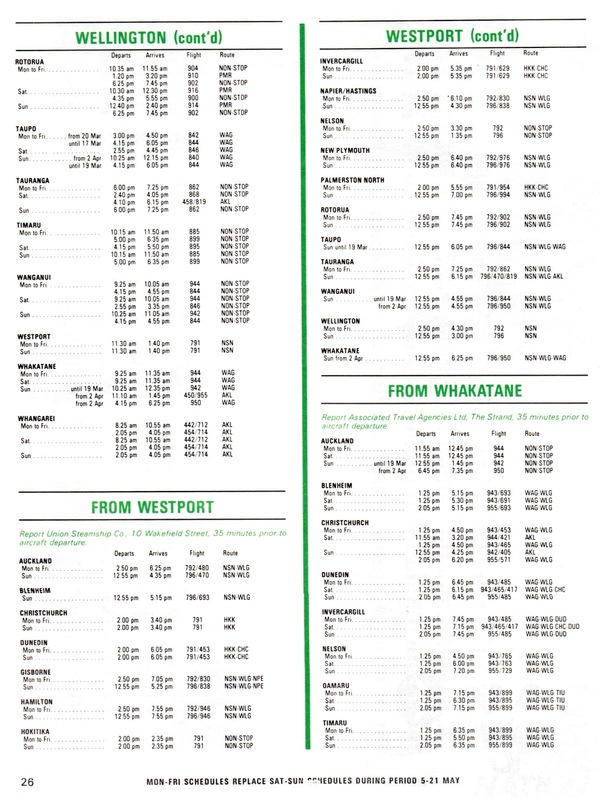 On the 31st of October 1970 Westport Airport was reopened and the following day a six day a week Friendship service from Wellington to Nelson, Westport, Hokitika and Christchurch and return was introduced with both northbound and southbound flights operating through Westport in the afternoon. 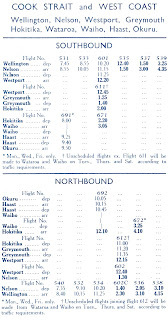 While the trans-alpine service between Hokitika and Christchurch proved to be successful the Nelson-Westport-Hokitika service continued to be a loss maker. There was very little through traffic on the Nelson-Hokitika and Westport-Christchurch links. 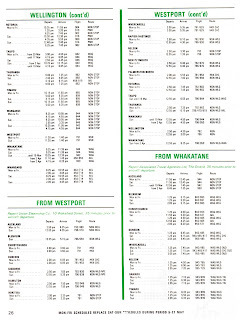 Only an average of 1.8 passengers travelled from Westport to Christchurch each day, 1.4 from Westport to Hokitika and 1.85 from Hokitika to Westport and Nelson. 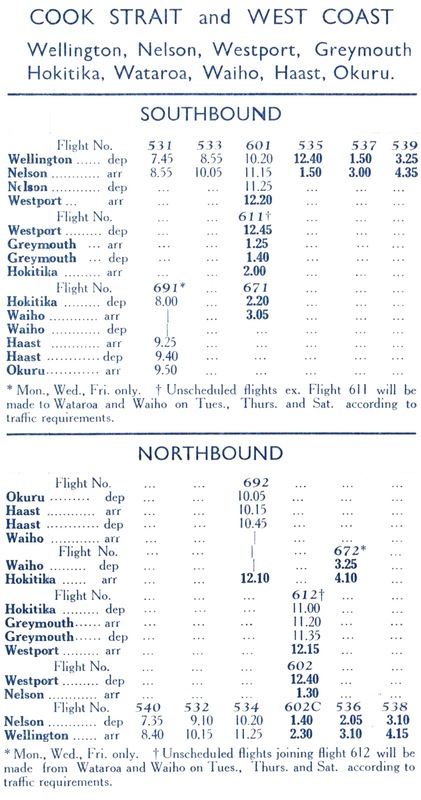 NAC announced it was going to withdraw the flights between Westport and Hokitika from the 6th of June 1972 with Hokitika receiving a Sunday to Friday service from Christchurch and Westport a Sunday to Friday service from Wellington and Nelson. This cut saved the National Airways Corporation some $ 85,000 per annum. One of the features of the Friendship to Westport was it carrying The News. This began on the 19th of August 1972. This was the first time NAC was used regularly to deliver the whole publication of a daily newspaper. The newspapers which were printed in Nelson were delivered to the airport in time for NAC's 1.30 pm flight which operated Monday to Friday. The annual freight load was over 50,000lbs of newspapers. 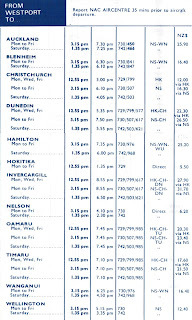 Meanwhile, the Hokitika-Christchurch continued to enjoy good loadings but passengers to and from Hokitika often found they were unable to get seats and make connections at Christchurch with flights to the North Island. 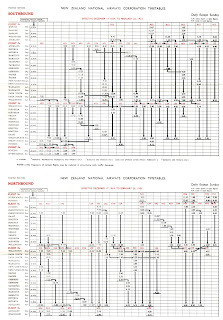 To counter this NAC reinstated the Hokitika-Westport link on the 3rd of June 1975 on a year’s trial. The airline hoped that a proportion of Hokitika passengers wanting to get to the North Island would use it and fly to Wellington, via Westport and Nelson. It was also hoped that Westport passengers would use the link via Hokitika to travel to and from Christchurch. The new schedule was such The News was not ready when the flight from Nelson left for Westport and so Capital Air Services and later Nairn Aviation were contracted to carry the newspapers. In 1975 NAC introduced its new "Wings of the Nations" orange and red colour scheme. Fokker Friendship ZK-NAO at Westport on 26 January 1977. On the 1st of April 1978 the Government merged NAC, the domestic airline, with Air New Zealand, the international airline into a single airline under the name Air New Zealand. Brilliant read. Thanks very much for your research and effort. I really enjoy the information and knowledge I gain from your articles. Top notch !! 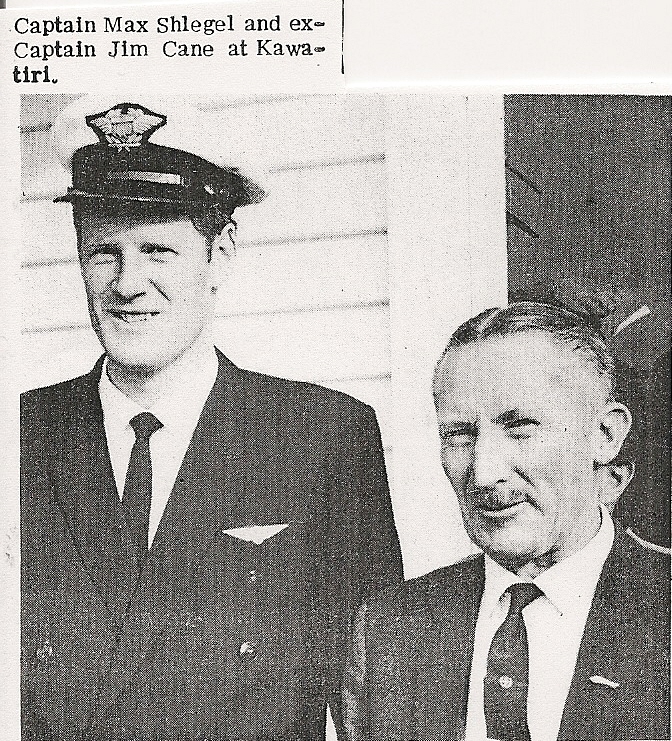 Interesting to read the potted biography of Jim Cane, one of the 'forgotten' early birds. Fantastic writeup and historical report Steve. We'd love to share all the West Coast photos you have to that site, so can we have your permission to do so, please?